When he was working on the film version of his novel A Home at the End of the World, Pulitzer Prize winning writer Michael Cunningham was given the screenplay version of Susan Minot’s Evening which the writer had adapted from her own work. Soon after, Cunningham called Minot to say that he was interested in working on the script but wanted her permission to make some serious changes in order to get himself invested in the story and Minot agreed. In addition to changing states (for budgetary reasons), dropping some characters and promoting smaller ones to lead roles, Cunningham crafted a script that does include some of his frequent issues such as a love triangle between a woman and two men (similar to A Home) and called on some of the feelings and situations he’d recently dealt with in the final days of his own mother’s life. In Evening, actresses Toni Collete and Natasha Richardson play siblings who reunite in the family home for the death of their mother (played by Richardson’s own real life mother Vanessa Redgrave). As Ann (Redgrave) dreams in her fevered, medicated state, we are whisked back in time to a few fateful days in the 1950’s when Ann journeyed to her old college friend’s wedding. Now played by Claire Danes (always excellent although she never quite fits the “period film” mode), Ann rides along with Buddy (a wonderful Hugh Dancy), as they arrive at Buddy’s home for the wedding of his sister Lila (Mamie Gummer) where her mother (Glenn Close) is in a frenzy over seating charts and Lila seems to have cold feet, still somewhat in love with her girlhood crush on the servant’s son, Harris (Patrick Wilson). As Harris, Wilson has the thankless role of playing the beautiful larger than life character that virtually everyone is in love with and while that doesn’t sound like a challenge, he isn’t given enough time to create a worthwhile character of his own and we realize what a waste the talented Wilson (so amazing in Little Children and the shocking Hard Candy) is in the piece. While it’s easy to predict and the film’s entire plot was given away in the trailer (if you haven’t seen it, try to fast forward through it if you’re ever faced with it), it’s still a luscious, beautifully crafted piece with extraordinary acting, however it seems to have suffered from the overwhelming pomp of the people involved including the award winning writer, cast (I’ve neglected to mention that Gummer’s own mother, Meryl Streep plays her character as an older woman), Being Julia’s Hungarian cinematographer turned director Koltai, and enough moments that recall Fried Green Tomatoes and Bridges of Madison County to try and force us to weep, but it’s still an entertaining soap, although nowhere near worthy of all of the talent involved and would make a fine weekend matinee film at home. 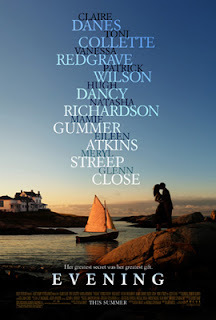 Note: for the best of Cunningham, check out the unjustly ignored A Home at the End of the World and the Academy Award winning The Hours (which stars some of the finest members of the cast of Evening).